This image made available by NASA on Wednesday, Jan. 2, 2019, shows images with separate color and detail information, and a composited image of both, showing Ultima Thule, about 1 billion miles beyond Pluto. The New Horizons spacecraft encountered it on Tuesday, Jan. 1, 2019. A NASA spacecraft 4 billion miles from Earth yielded its first close-up pictures Wednesday of the most distant celestial object ever explored, depicting what looks like a reddish snowman. Ultima Thule, as the small, icy object has been dubbed, was found to consist of two fused-together spheres, one of them three times bigger than the other, extending about 21 miles (33 kilometers) in length. NASA's New Horizons, the spacecraft that sent back pictures of Pluto 3½ years ago, swept past the ancient, mysterious object early on New Year's Day. It is 1 billion miles (1.6 billion kilometers) beyond Pluto. 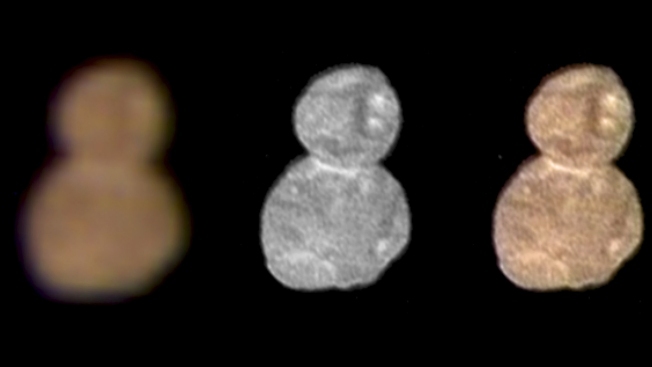 On Tuesday, based on early, fuzzy images taken the day before, scientists said Ultima Thule resembled a bowling pin. But when better, closer pictures arrived, a new consensus emerged Wednesday. "The bowling pin is gone. It's a snowman!" lead scientist Alan Stern informed the world from Johns Hopkins University's Applied Physics Laboratory, home to Mission Control in Laurel. The bowling pin image is "so 2018," joked Stern, who is with the Southwest Research Institute. The celestial body was nicknamed Ultima Thule — meaning "beyond the known world" — before scientists could say for sure whether it was one object or two. With the arrival of the photos, they are now calling the bigger sphere Ultima and the smaller one Thule. Thule is estimated to be 9 miles (14 kilometers) across, while Ultima is thought to be 12 miles (19 kilometers). 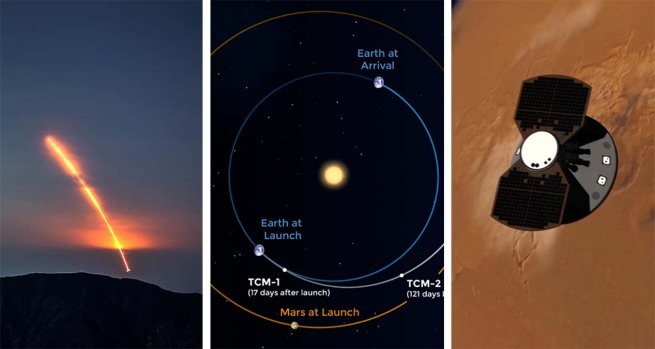 Scientist Jeff Moore of NASA's Ames Research Center said the two spheres formed when icy, pebble-size pieces coalesced in space billions of years ago. Then the spheres spiraled closer to each other until they gently touched — as slowly as parking a car here on Earth at just a mile or two per hour — and stuck together. Despite the slender connection point, the two lobes are "soundly bound" together, according to Moore. Scientists have ascertained that the object takes about 15 hours to make a full rotation. If it were spinning fast — say, one rotation every three or four hours — the two spheres would rip apart. Stern noted that the team has received less than 1 percent of all the data stored aboard New Horizons. It will take nearly two years to get it all. The two-lobed object is what is known as a "contact binary." It is the first contact binary NASA has ever explored. Having formed 4.5 billion years ago, when the solar system taking shape, it is also the most primitive object seen up close like this. About the size of a city, Ultima Thule has a mottled appearance and is the color of dull brick, probably because of the effects of radiation bombarding the icy surface, with brighter and darker regions. Both spheres are similar in color, while the barely perceptible neck connecting the two lobes is noticeably less red, probably because of particles falling down the steep slopes into that area. So far, no moons or rings have been detected, and there were no obvious impact craters in the latest photos, though there were a few apparent "divots" and suggestions of hills and ridges, scientists said. Better images should yield definitive answers in the days and weeks ahead. Clues about the surface composition of Ultima Thule should start rolling in by Thursday. Scientists believe the icy exterior is probably a mix of water, methane and nitrogen, among other things. NASA released sobering footage of Hurricane Florence as it approaches the Atlantic Coast. The snowman picture was taken a half-hour before the spacecraft's closest approach early Tuesday, from a distance of about 18,000 miles (28,000 kilometers). Scientists consider Ultima Thule an exquisite time machine that should provide clues to the origins of our solar system. It's neither a comet nor an asteroid, according to Stern, but rather "a primordial planetesimal." Unlike comets and other objects that have been altered by the sun over time, Ultima Thule is in its pure, original state: It's been in the deep-freeze Kuiper Belt on the fringes of our solar system from the beginning. "This thing was born somewhere between 99 percent and 99.9 percent of the way back to T-zero (liftoff) in our solar system, really amazing," Stern said. He added: "We've never seen anything like this before. It's not fish or fowl. It's something that's completely different." Still, he said, when all the data comes in, "there are going to be mysteries of Ultima Thule that we can't figure out."